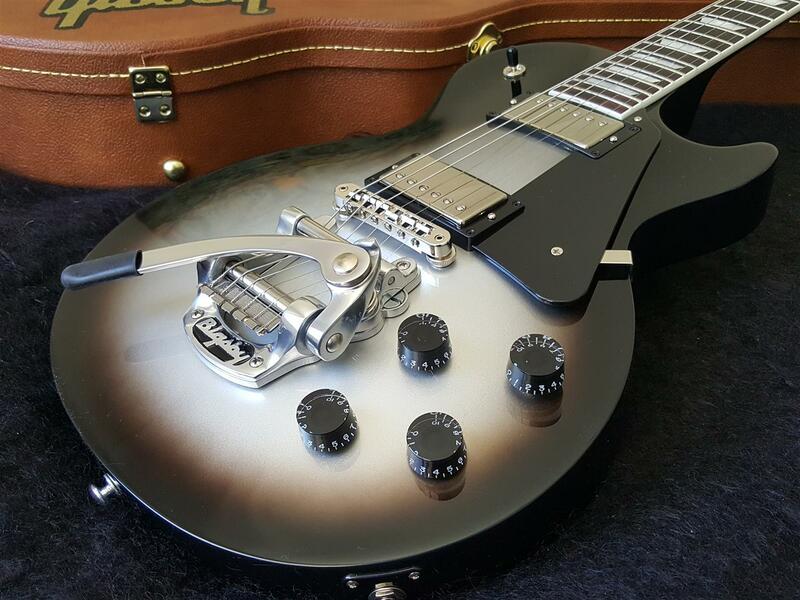 Brand new Gibson 2018 Les Paul Studio Elite - Silverburst Limited Edition with Bigsby, mint not been a demo in a store. The Les Paul Studio is a stylish, essential guitar that delivers on design, tone and playability. For 2018 the Special Run Gibson Les Paul Studio Elite gives a premium look and feel. Nickel hardware, rosewood fingerboard and ultra-modern weight relieved body are all wrapped in a mythical Silverburst finish. The classic Bigsby tailpiece finishes things off beautifully matching the 57 Classic pickups legendary tones. The Gibson Les Paul Studio Elite covers a wide sonic territory with its coil tapped complement of 57 Classic pickups. This combination unlocks plenty of creative textures to flesh out ideas in the studio or onstage, from classic cleans and modern drive to single-coil spank and sparkle. The Les Paul Studio benefits from an Ultra-modern weight-relieved body for extra comfort for long sessions and performances. The classic SlimTaper mahogany neck conjures that of the '60s Les Pauls that so many players fell in love with for its smooth, fast-style response and feel. And not only has this Gibson Studio Elite been Plek'd for precision playability, but new for 2018, its frets have also been cryogenically treated, increasing their lifespan by four times.